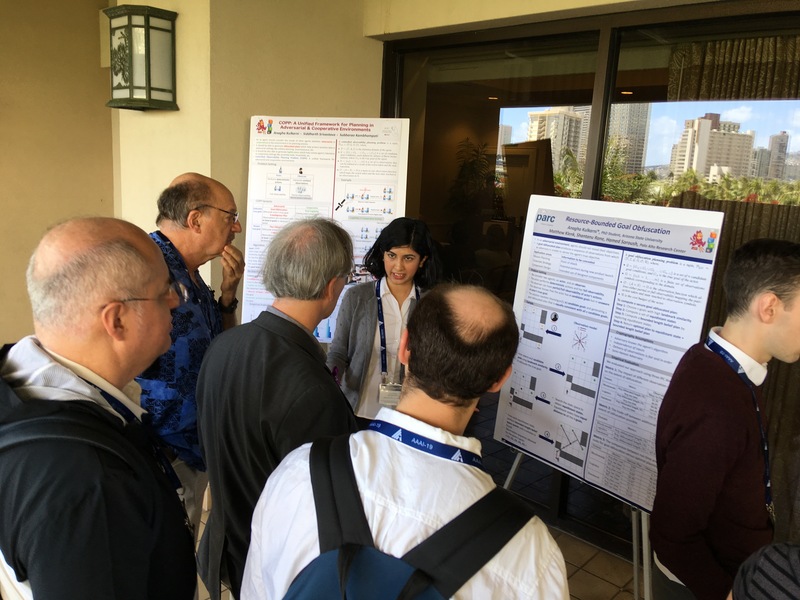 PARC Researchers, Johan de Kleer, Matthew Klenk, Shiwali Mohan and Jesse Vig attended the 33rd Conference of the Association for the Advancement of Artificial Intelligence (AAAI-19) in Honolulu, Hawaii. Shiwali Mohan presented “On Influencing Individual Behavior for Reducing Transportation Energy Expenditure in a Large Population” at the ACM/AAAI Conference on Artificial Intelligence, Ethics and Society. This work combines machine learning, multi-modal route planning and user studies to demonstrate the potential of 20% reduction in delay and a 4% reduction in energy consumption across the Los Angeles region by merely sending 10% of the population text messages with alternatives. Jesse Vig presented “Comparison of Transfer-Learning Approaches for the Dialog Systems Technology Challenge 7 (DSTC7)” at the Dialog System Technology Challenge Workshop. This work demonstrates how unsupervised deep learning embeddings from sentiment analysis tasks can be used to facilitate the selection of the response in dialog tasks. This significantly reduces the amount of training necessary for dialog systems. Anagha Kulkarni presented work from her PARC internship on “Resource-Bounded Goal Obfuscation” that defines a new problem formulation and solution for planning in adversarial environments at the Plan, Intent, and Action Recognition Workshop. In this formulation, the agent trades off optimality to ensure that any observer is unable to discern the true objectives of the agent. PARC also hosted a booth at the AAAI Job Fair to highlight our commitment to fundamental research in AI and its potential applications in job recruitment. Learn more about the career and internship opportunities at PARC.